Southwest Florida Yacht Club, “The Cruisingest Yacht Club in the USA©”, in partnership with the four United States Power Squadrons in SW Florida (Cape Coral, Fort Myers, San Carlos Bay, and Sanibel Captiva), is continuing its popular Local Waters Seminar in October & November 2018. 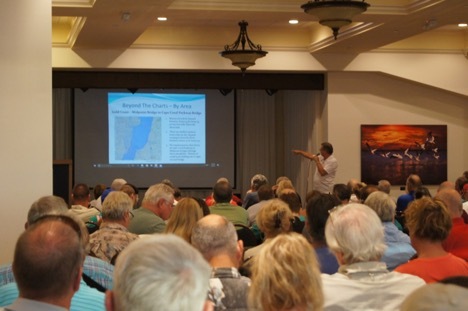 The seminar, developed as a service to the local boating community, discusses local water tips “beyond the charts” and our many nearby boating destinations based on SFYC member experiences and insights. We have had almost 500 attendees for the seminars conducted to date. Most of the attendees were experienced boaters who seemed to enjoy learning more about the local waters from other boaters and sharing valuable information only gained through experience. We will be hosting two additional sessions of the Local Waters Seminar on January 29, 2019 and February 26, 2019. The seminars are free and are open to the public. This seminar is for anyone who would like to learn more about our many nearby boating destinations: where to go, how to get there and what to expect along the way and when you arrive. Active boaters, of course, but people in areas such as the boating industry, media, hospitality and real estate may find it informative as well. The next two sessions of the Local Waters Seminar will be held on Tuesday, October 23, and Tuesday, November 13. Each session runs from 6:30 – 9:00 pm at The Marina at Edison Ford (Pincher’s) at 2360 W 1stStreet, Fort Myers. Registered attendees will enjoy a free drink, compliments of SFYC. Please reserve your spot by contacting Harvey Steele, SFYC Past Commodore at hsteele@handeecleat.comor 239.671.8887. You can learn more about this seminar at the Southwest Florida Yacht Club website www.southwestfloridayachtclub.com.